We have gathered in this hallowed chamber to begin the work of the second session of our democratic parliament, nine months after its first members were sworn in. Let met say this from the beginning that the challenges ahead of us require that we move away from spectacle and rhetoric and bend our backs to the serious work ahead of us. 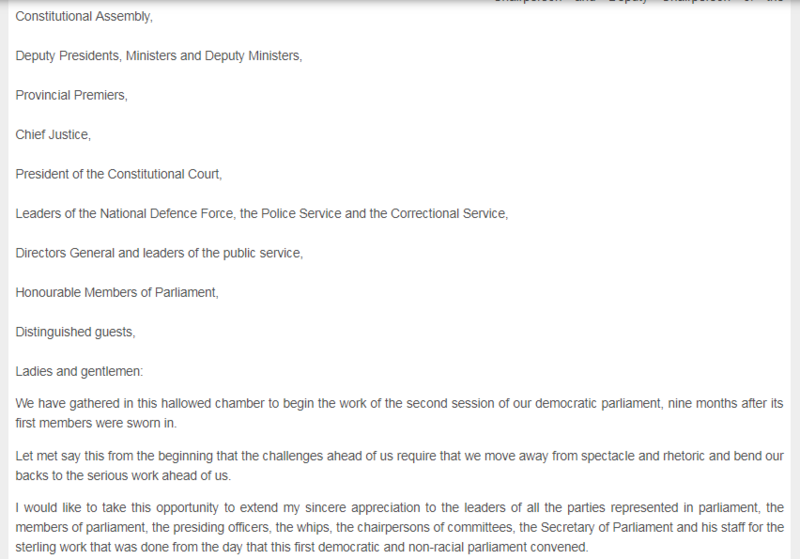 I would like to take this opportunity to extend my sincere appreciation to the leaders of all the parties represented in parliament, the members of parliament, the presiding officers, the whips, the chairpersons of committees, the Secretary of Parliament and his staff for the sterling work that was done from the day that this first democratic and non-racial parliament convened. Of necessity, much of this work had to do with the establishment of our organisations structures and evolving a rhythm of work which would enable us to discharge our responsibilities in an effective and efficient manner. All of us, precisely because we had never sat in any democratic parliament before, had to begin the continuing process of learning how to carry out our functions as people's deputies. We had to educate ourselves in an atmosphere characterised by a critical public focus which did not necessarily allow for the reality of that inexperience. Undoubtedly, many of us, both in the legislature and in the executive have made mistakes. But mistakes are an inevitable element of any process of learning. It is always the case that the spectators are better than the players on the field. None of us should therefore feel ashamed for having committed errors. We must, however, learn from these mistakes so that we do indeed improve our performance. Whatever it is that our critics might have to say, we can take pride in the fact that not only did we succeed to establish our two houses of parliament, as required by the Constitution, but we also ensured that they play their role in the government of our country. We are pleased that the honourable members of both the National Assembly and the Senate have not been satisfied merely to endorse the bills that have been presented to them, but have participated actively in improving such draft legislation, with the aim of ensuring that our laws are consistent with the glorious vision we share of creating a truly humane and people-centred society. Of particular importance is the fact that you, the legislators, have worked in a manner consistent with the objective of ensuring that ours should be a parliament of the people. This we have done by opening our proceedings to the public, to ensure that the people know what we are doing and by opening the doors to the people to address the legislative committees of parliament directly. This has also been replicated in our provincial legislatures, consistent with our objective of bringing government as close to the people as possible. We can therefore claim with justification that such legislating as has been approved is representative of the will of the people and therefore enjoys a degree of legitimacy and enforceability which all previous laws could never have. Undoubtedly, we must continue to look for ways and means of ensuring that the people as a whole are better informed of what we are doing and are given ever improved capacity to intervene in our proceedings in an informed and purposive manner. In the recent past, much has been said about corruption among some members of this parliament and other leading political figures in the country. Many within and without this chamber and among the mass media have been very keen to condemn and to propel us into precipitate action on the basis of mere allegations. We have resisted this and will continue to do so. We have a responsibility to act on the basis of fact and not allegations, however strident the voice that makes those allegations. Furthermore, we firmly believe that it is important that we build a society on justice and fairness. At all times we must guarantee the right of the accused to be heard, without making any concession to a primeval instinct to pillory and burn people at the stake. As South Africans, with our particular history, we must be extremely careful not to reintroduce the McCarthyism atmosphere which resulted in people being herded into unthinking hordes that sought the blood of anybody who was labelled a communist. We must also make this clear that we need no educators with regard to the matter of rooting out corruption, which we will deal with firmly and unequivocally, whoever may be involved. We are conscious of the reality that corruption in many forms has deeply infected the fibre of our society. It is not possible to have a society based on a lie and patent injustice as apartheid society was, without this spawning corrupt practices. Precisely because we face the challenge of dealing with systematic corruption we need a dispassionate and systematic approach to this question and not allow ourselves to be stampeded by responses which are not very different from a witchhunt. To address another important matter of the day, later this year we will be holding our local government elections to complete the process of establishing the democratic structures which we need to ensure that the people are able to take their destiny into their own hands. The importance of these popularly elected structures at the local level cannot be overestimated. It is at this level that we must deliver change. It is at this level that the people can most directly participate in making decisions about important matters that affect their daily lives. It is also at this level that we must confront the divisions created by the system of apartheid and grapple with the problems that arise out of the racial and territorial maldistribution of resources and infrastructure that was imposed on the country by this system. In reality, it is impossible to enter this next and critical stage of the dismantling of the system of apartheid until we have democratically elected structures of government which enjoy a popular mandate to bring about the non-racial, non-sexist and democratic society demanded of us by the constitution. I would therefore like to take this opportunity to call on all our people in their millions to take the forthcoming local government elections very seriously. The immediate task that we must all fulfil is to register as voters. I appeal to all political parties, both those represented in our national and provincial legislatures and those outside of these structures, to do everything in their power to mobilise the people to register as voters. This appeal also extends to all other people's organisations and institutions of civil society to use their influence or organise the people to register for an participate in the local government elections. It is also the obligation of all political organisations that will participate in the local government elections to ensure that we experience no violence or intimidation during the conduct of our election campaigns. It would also like to take advantage of this occasion to make it very clear to the country as a whole that the Government will not allow anybody to obstruct the process of the registration of voters, regardless of the social status of the persons concerned. It is important to bear in mind that unlike our elections of last year, these elections will be conducted with democratically elected national and provincial government in place. These governments will not hesitate to use all legitimate force at their disposal to ensure that nobody stands in the way of the people to express their will freely. I am also pleased to report that whatever the teething problems, the concept and vision of a government of national unity has proved its correctness and viability. It has succeeded in its intentions of ensuring co-operation among our people as a whole, the development of a national consensus around a whole range of important matters, enabling important minority parties to have a real voice in the government of the country and contributing to peace, stability and confidence in the future of our country. At the national level, we continue to work together in a non-confrontational atmosphere further to elaborate rules, conventions and procedures to ensure that the Government of National Unity functions effectively and is able to address in a balanced way the fact of different parties with different policies and the tension between the democratic rights of the majority party and the effective participation of the minority parties. In this regard I should mention that we have agreed with the Provincial Premiers that we will share our views on these matters with them and their administrations, to evolve common practices conducive to good governance. Happily, all the major parties have committed themselves to the perspectives contained in the commonly-evolved Reconstruction and Development Programme. This constitutes the firm basis for the continuing co-operation among the various parties inside and outside the Government of National Unity, without which such co-operation would become impossible. We must however also make this point that when all is said and done, as individuals and as parties we belong to the same government. We therefore have a collective responsibility both to participate in the formulation of policy and the elaboration of decisions and to defend, take responsibility for and implement those decisions. In the period ahead of us we shall therefore insist on the collective responsibility and accountability of everybody concerned as part of a process in which we must all engage, of raising the levels of discipline and responsible action throughout the society. A few days ago, we were honoured to participate in the moving and historic opening of our Constitutional Court. This is yet another giant step in the transformation of our judicial system and the building of a law-governed society which will protect the fundamental human rights of all our citizens and ensure that the people are not threatened by arbitrary and oppressive rule. The process of the transformation of the judiciary will continue, among other things to ensure that it is representative of our society and to enable even the poor to have the ability to obtain legal redress where need arises. All necessary steps will also be taken to ensure that the judicial system plays its proper role with regard to the important matter of reducing the levels of crime in our society and addressing the legitimate concern of the public that we do not create the situation in which the people begin to feel that criminals and wrong-doers are being favoured while the interests of society are being ignored. Among these will be the Human Rights Commission, the Public Protector, the Gender and Youth Commissions, the Inspector General of Intelligence and the structures that will be created by the pending Open Democracy or Freedom of Information Act. We are determined to move with all due speed to create and strengthen all the institutions of governance that we have spoken of to deal with the matter of effective and open government. Once more, we must address a few words to our public service, without whose dedicated service to the people effective government and public delivery to the population will be impossible. We are committed to the motivation of all public sector workers so that they become a conscious, willing and skilled agent for the transformation of our society according to the objectives spelt out in the Reconstruction and Development Programme. As part of this process, Cabinet has given instructions to all Ministers to interact continuously with all members of their ministries and departments to brief them about their tasks, to report on progress achieved, to agree on how to overcome obstacles to the process of transformation and generally to be involved in the struggle for change. We have also invited the public sector unions to participate as fully as possible in the budgeting processes so that they make their own contribution to the difficult task of deciding the best possible allocation of the limited resources available to government. We are convinced that an adversarial relationship between the executive and the administration would impact negatively on the common task which these two institutions share of serving the people of South Africa. Such an outcome must be avoided at all costs. Accordingly, we have been available and willing to address all matters of concern to the public service workers, including questions of salaries, promotions, pensions and other issues relevant to working conditions. It is however also important that the public service should be willing to join hands with the government to address other important matters such as the racial and gender imbalances within the public service. The public service will never be fully acceptable to the people as a whole and can never be truly responsive to the needs of the people unless it is composed in all its ranks in a manner that reflects the composition of our population. To speed up this process, the government will continue to implement measures and programmes aiming at ensuring that those who were disadvantaged by apartheid in the past are given the capacity to catch up with those who were given the possibility to develop and advance themselves in terms of management and other skills. This is what we mean when we talk of affirmative action programmes. We speak of a human resource development programme which will ensure that all our people, and not merely some, are given the possibility to develop their talents and to contribute to the reconstruction and development of society to the best of their ability. I therefore call on all our people to refuse to listen to the false prophets who seek to perpetuate the apartheid divisions and imbalances of the past by presenting affirmative action as a programme intended to advantage some and disadvantage others on the basis of race and colour. It is also appropriate that on this occasion we draw the attention of the country to the actual reality that the government has extremely limited resources to address the many and urgent needs of our people. We are very keen that this real situation should be communicated to the people as a whole. All of us, especially the leadership of political organisations and civil society, must rid ourselves of the wrong notion that the government has a big bag full of money. The government does not have such riches. Because we have started the process of changing spending priorities, we do realise that the process of restructuring the budget so that it is directed towards addressing the needs of the people is no easy matter. This is especially so in the light of the contractual obligations that bind the state as well as carry over expenditure which cannot be avoided. We must all absorb this reality into our thinking in a cold and dispassionate manner and not allow ourselves to be seduced into a world of false hopes leading to unrealistic actions based on the wrong assumption that the government can be coerced to meet demands that it cannot meet, however justified and legitimate these demands might be. It is important that we rid ourselves of the culture of entitlement which leads to the expectation that the government must promptly deliver whatever it is that we demand, and result in some people refusing to meet their obligations such as rent and service payments or engaging in other unacceptable actions such as the forcible occupation of houses. As we have said with regard to the public sector unions, we seek to ensure that the budgeting process is as transparent and as participatory as possible. It is the right of the people to know how much money they have contributed to the finances of the state and how that money is being used. It is their right also not only to know, but also to contribute their views as to how public funds should be disbursed. That is why such bodies as the parliamentary committees and the National Economic Forum have been brought into the budgeting process. Tomorrow we shall be launching a very important body, the National Economic Development and Labour Council -NEDLAC. This crucial body will bring together representatives of government, labour, capital and civil society. This will be one of the institutions on which we will relay in terms of decisions that we must arrive at with regard to the use of public funds and assets. We trust that the representatives that sit of NEDLAC will, in turn, reach out to their own constituencies to inform and involve them in the process of arriving at decisions which bear, among other things, on the disbursement of public funds. What we have said constitutes a firm undertaking on the part of government to ensure a participatory process with regard to the public finances. Bearing this in mind, we believe that government has a right to expect that the public at large should behave in a responsible manner when it addresses the question of the obligations of government to meet the material expectations of the people. I would like to address this matter bluntly. The strike action which has been threatened by a few of the public sector unions will not succeed to force the government to make available money for large wage and salary increases. I say this being fully aware and sympathetic to the plight of many public sector workers who are indeed poorly paid. I say it precisely because I am aware of the reality that, for no fault of its own, the government literally does not have the money to meet the demands that are being advanced. Mass action of any kind will not create resources that the government does not have and would only serve to subvert the capacity of government to serve the people. I would like to repeat that the government is committed to entering into a comprehensive three-year agreement with the public sector unions to address all matters of mutual interest, including improved packets particularly for the lowest-paid public sector workers. In this regard, I would like to extend our sincere appreciation to the leaders and the majority of the public sector unions which have engaged with us in a constructive manner which is sensitive to the needs of the country as a whole. We are ready to work together with these unions to solve the problems which face us together, for the benefit of the workers and society as a whole. I must also address the question of the attempt by some in our country to introduce anarchy into our society. I speak of those who engage in such totally unacceptable practices as the murder of police officers, the taking of hostages, riots, looting, the forcible occupation of public buildings, blocking of public highways, vandalisation of public and private property and so on. Some of those who have initiated and participated in such activities have misread freedom to mean license. They have misinterpreted popular participation to mean their ability to impose chaos on society. They have wrongly concluded that an elected government of the people is a government that is open to compulsion through acts of anarchy. Let me therefore make this abundantly clear that the small minority in our midst which wears the mask of anarchy will meet its match in the government we lead and the masses of the people who put that government into office. This they must know that we are not afraid of struggle. We are, after all, a product of confrontation and struggle. In the past we were not defeated by forces more powerful than they. In this instance, we will not be defeated by those whose actions have nothing to do with defending or advancing the cause of the people. We are certain that the democratic trade unions movement will also join hands with us to isolate and defeat the minority which seeks to discredit the trade union movement by engaging in violent activities during the course of strike actions. Let is therefore be clear to all that the battle against the forces of anarchy and chaos has been joined. Let no one say they have not been warned. In the same vein we must address the question of crime. The situation cannot be tolerated in which our country continues to be engulfed by the crime wave which includes murder, crimes against women and children, drug trafficking, armed robbery, fraud and theft. We must take the war to the criminals and no longer allow the situation in which we are mere sitting ducks of those in our society who, for whatever reason, are bent to engage in criminal and anti-social activities. Instruction have therefore already gone out to the Minister of Safety and Security, the National Commissioner of the Police Service and the security organs as a whole to take all necessary measures to bring down the levels of crime. I would also like to take this opportunity to emphasise that the matter of our safety and security is not one that should be left only to the law enforcement organs. For them to succeed, they need the full and active support of all our communities. The police-community fora that have been established are extremely important with regard to reinforcing co-operation between the police and the public and therefore increasing the capacity of the country as a whole to deal with the common problem of crime. I would therefore like to urge the formation of such fora where they do not exist and the involvement of all opinion makers in all localities in the processes which are aimed at enhancing the people's safety and security. The Government is determined to do everything in its power to move speedily towards the formation of the new Police Service. We are very interested to address the matter of the earnings and working conditions of all members of the Police Service and to give this Service the necessary means to enable it do discharge its responsibilities as effectively as possible. In this regard, we must also make it clear that the Government is opposed to and has no intention to conduct a witchhunt against the police as a result of activities arising from orders given to o the police by the apartheid regime. We therefore urge every member of the Police Service to get down to the urgent and pressing matter of enhancing the safety and security of the people as a whole. When we opened parliament last year, we addressed the issue of racism in the workplace and in our society at large. We continue to be confronted by this problem. People have continued to die as a result of the continuing practice of racism - the latest being a victim of racist resistance to the use of a former white school by lack children. Those who are responsible for these crimes of racism must be brought to book without delay. It is clear that insufficient progress has been made in many workplaces and elsewhere in our society to deal with this cancer. We trust that the Human Rights Commission will help us to deal with this matter firmly and continuously by encouraging the public to report all instances of racism so that these can be brought to light. The Government has discussed this matter and is committed to carry out its constitutional obligation of transforming our country into a non-racial society. The situation cannot be allowed in which anyone acts in a manner which perpetuates the practice of apartheid. Both the government and the people as a whole share a common obligation to live up to the very purpose of the struggle that millions of people waged, of ending racism in our country and ensuring the equality of all our people. One of the most sensitive matters we must address this year is the establishment of the Truth and Reconciliation Commission. We must move towards this as speedily as possible so as to remove all the uncertainties that have been created through the protracted discussion of this issue. The legislature is currently discussing the bill dealing with this matter and is receiving public submissions. I would like to urge that we achieve speedy progress in this regard. I would also like to draw the attention of the legislature and the country as a whole, that our purpose in establishing the Truth and Reconciliation Commission is both to obtain the truth and to reinforce the process of reconciliation which our country needs. Nothing we do should lead to the heightening of tensions and the rekindling of the violent political conflicts which we have succeeded so well to bring under reasonable control. This must also be borne in mind that many of us, who suffered quite significantly as a result of apartheid repression, are making no demands which would result in vengeance against or persecution of those who might have harmed us or those close to us. Urgent steps are also required to end the continuing political violence in the province of KwaZulu-Natal. This is both a law-enforcement issue and a matter for the political parties and leaders in the province to address. If we claim to be genuine leaders of our people, it must surely be one of our principle tasks to end the killing both to save lives and to create the climate of peace and stability which we need to develop the province which is among the poorest areas in the country. Progress has been made with regard to the basic challenge of building a better life for all our people. Some of the projects which we announced last year, including the feeding of school children and the provision of free health services to certain sections of our population, have been implemented. It is necessary that we draw the necessary lessons from our experience in this effort to meet the basic needs of the people. One of these, as we have stated already, is that the Government has very limited resources to address the multiple and urgent needs of our people. It is therefore critical that we determine a proper set of priorities on which we should focus to effect a visible and sustainable improvement in the lives of the people. It is also important that we implement any projects in this regard not in an ad-hoc manner, but within the context of 5-year and other medium and long-term plans and projections. The Cabinet has discussed this matter and decided on our priorities, which will include rural and urban development, human resource development, job creation and health. Detailed inter-departmental work is now going on to elaborate plans reflecting this focus, to ensure that the Government uses in a rational and effective manner the limited resources at its disposal. In this regard, government will not make any commitments which it cannot meet on a continuous basis. As compared to the time last year when we had to announce programmes for transformation without detailed preparation of implementable and affordable plans, we are now in the fortunate situation that we are well on the way to finalising detailed plans, to meet our firm commitment to build a better life for all South Africans. Once they are ready, and after the necessary consultation with the elected representatives at both national and provincial levels, the local community structures and the public at large, we are determined, this year, to move speedily to expedite the process of social transformation and the improvement of the quality of life of our people, which is required of us in the context of our programme for reconstruction and development. This will be one of the high points in our national life, this year, when we announce realistic targets with regard to such needs as houses, clean water, primary health care and jobs. I must repeat that it is our firm intention that we set these targets within the parameters of what the budget can carry, consistent with our objective of ensuring fiscal discipline. We will be able to achieve this degree of precision because of the significant progress that has been made in the various ministries at both national and provincial levels with regard both to the reorganisation and strengthening these structures and the elaboration of policies aimed at the fundamental transformation of our country. For this, we should salute the Ministers, the Premiers, the Directors General and other members of the public service for the work they have done to increase the capacity of government to engage in the process of transformation. With regard to this critical matter of socio-economic transformation, I would, once again, like to draw attention to the important role that NEDLAC will have to play to ensure effective co-ordination and partnership between government, labour, business and community-based organisations. This body will play a critical role in helping to develop the consensus we need with regard to the critical challenges of reconstruction and development, including economic growth, socio-economic improvement and the involvement of all stakeholders in all decision-making processes. In a sense, NEDLAC and other fora where consensus is being achieved across the social spectrum, are crucial power houses of our nation-building and reconstruction efforts. They are the engine which cannot be derailed by the whims of individuals or political parties. As the year begins, there are signs that our economy is beginning to pick up. The Government sondiers it a matter of critical importance that everything should be done to encourage a climate conducive to sustained and high levels of economic growth. We are therefore ready to deal and have been dealing with all matters that are relevant to this goal, in particular to ensure the creation of an investor-friendly climate. Everything must be done to encourage a significant upward movement in the rate of investment to increase the productive capacity of the economy, to modernise and restructure the economy, to create jobs and to increase our international competitiveness. With regard to these economic issues, I would also like to emphasise our continuing commitments to fiscal discipline, including the reduction of the budget deficit, the reduction of the share of the national income that accrues to government and the reorientation of government expenditure away from recurrent disbursements towards investment. The relevant authorities, including the Reserve bank, remain seized of the issue of the two-tier exchange rate and the general question of foreign exchange controls. These matters will be addressed with the necessary speed and the equally necessary sense of responsibility towards the economy as a whole. At the same time, the Government is working as expeditiously as possible to address the question of the reorganisation of state assets. With regard to these assets, our objective is to ensure that they are used in a conscious and consistent manner to address the objectives of the RDP, One of these must surely be to reduce the public debt and therefore the burden of servicing this debt, so that more public funds can be released to address the needs of the people. This year parliament will be faced with a heavy load of extremely important legislation that it will have to deal with. The importance of this legislation derives from the fact that it will be transformative in character, aimed at the creation of the social order which for which many struggled and sacrificed. One of these pieces of legislation is the Labour Relations Bill which represents not only a decisive shift from our adversarial past in labour relations, but also our commitment to a more democratic style of governance. While correctly entrenching the right of workers to resort to strike action, the Bill places emphasis on conciliation and negotiation of disputes and should contribute significantly to reducing the level of unnecessary industrial action and creating greater possibilities for joint action between government, labour and business to build a prosperous and just society. Similarly, white papers and legislation will be introduced covering such areas as education, health, housing, water affairs, safety and security, defence, truth and reconciliation, freedom of information, land affairs, the public service, welfare and so on, to say nothing of the 1995-96 budget. This will undoubtedly tax the energies of the members and resources of parliament. However, we will have to ensure that we deal with all this legislation as expeditiously as possible, while consulting the people also as extensively as possible. We should therefore have an exciting session which should inspire all or people as they see their elected representatives create the legislative framework which will mark our continued movement away from the past towards the people-centred society we seek to construct. We will also have to ensure that the Constitutional Assembly makes progress towards the drafting to the new Constitution. It is important that this should be done so that we can have certainty as soon as possible about the constitutional framework within which the country should be governed. It may be worth repeating that we seek a constitution that is acceptable to the people as a whole. It was for this reason that all of those who participated in the drafting of the present constitution agreed to the concept of special majorities and an entrenchment set of principles. As we negotiate the new constitution, it is necessary to bear these observation in mind and conduct ourselves in a manner that ensures that we have as inclusive a process as possible. It seems necessary that there should be close co-operation and co-ordination between the legislature and the Constitutional Assembly with regard to the issue of consultation with the public, as both these bodies will be seeking to reach as many people as possible during this year. We will have to conduct the processes of public consultation in a manner that is both cost effective and enables the people genuinely to contribute both to the legislative and the constitutional debates. This year, the nations will be observing the related 50th anniversaries of the end of the Second World War and the establishment of the United Nations Organisation. Coming as we do from our own specific past, it will be important that we join in the observance of these historic events. Thus should we affirm our own commitment to the vision contained in the Universal Declaration on Human Rights, the UN Charter and other important legal instruments and conventions that the UN has evolved to deal with the issues of racism, war and peace, human rights and development. Among these conventions, which will be ratified during the course of this parliamentary session, is the very important International Convention on the Rights of the Child. We might also want to use this occasion to make our contribution to the international debate about the new world order, focusing in particular on such matters as a democratic international political order, universal prosperity, peace and stability - all of which are questions of great relevance to our own continent of Africa. In this regard, the UN Social Summit next month and the International Women's Conference in Beijing later in the year, will be crucial fora in which we should make our own humble contribution to the effort to create a better world. In this context, during this year we will pay particular attention to the all-round development and strengthening of our relations with our neighbours in Southern Africa, especially within the context of the SADC. We are all inspired by the reality of progressive developments in our region during the recent period. These include the successful democratic elections in Malawi, Mozambique, Namibia, Botswana and our own country, the restoration of democracy in Lesotho and the signing of the Angola Peace Agreement. All this augurs well for the future of all our peoples. At the same time, we are all aware of the tensions that are building up with regard to population movements within our region. We must treat this matter with all due sensitivity, conscious of the history of our region, including the destruction caused by the policy of aggression and destabilisation carried out by the previous regime. In all our actions we must move from the position that the fundamental objective we must pursue is friendship, co-operation and solidarity among the peoples of our region. We rake this opportunity to wish the people of Angola well and once more to convey to them and all their leaders our willingness to contribute whatever we can to assist in the establishment of a permanent peace and the strengthening of the democratic order. We will continue to make our contribution to the strengthening of the OAU, which remains an important instrument that we all need to address the serious concerns of the peoples of our continent. We also hope to conclude our negotiations with the European Union as soon as possible to strengthen our economic and other relations with this important group of countries in a manner that does not disadvantage any other country. In a fortnight will also be established the Joint South Africa - United States Commission which will supervise the important process of strengthening the relations between ourselves and the United States of America. In a few days the Prime Minister of Sweden will arrive in this city. We welcome this visit by the leader of one of the Scandinavian countries all of which played such an important role in the struggle for the emancipation of all our people. The visit also emphasises the positive manner in which our relations with the rest of the world are developing. It will be followed by other visits as well our own to other countries, in the interest of our own development and in the interest of a better world for all peoples. This parliament has, through death, lost some of the best among us. These include Firoza Adam, Thomas Nkobi and Joe Slovo. Let the results of this second session of our democratic parliament serve as our salute to them and a tribute to their memory. I am certain you will not fail them. I have the honour to declare the second session of our democratic parliament open.